Build your own MyStore, make product recommendations and get rewarded! A personalised collection of your favourite MyDeal products. Share it with family & friends, build your brand and earn money. Press “Get Started” to be guided through the sign-up process. Once you’ve made your MyStore you can fill it with your favourite products. Earn money from your followers' purchases when they use your coupon code. MyDeal.com.au is Australia’s most trusted online marketplace and Your One Stop Shop for the best prices on furniture, homewares, baby & kids, electronics, tools & equipment and so much more. 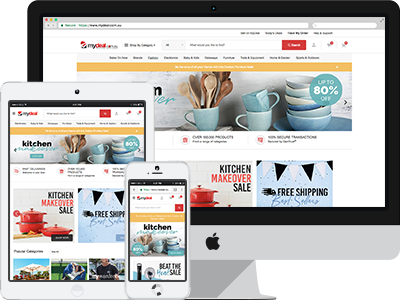 As one of Australia’s favourite online retailers, MyDeal sells over 300,000 in demand products from local and international brands.